South Dakota workers' compensation is a no-fault insurance plan provided to South Dakota employees for work injury compensation. Work injury compensation can include medical benefits and also lost wage compensation for qualifying South Dakota employees who are injured at work while they are performing their normal job responsibilities. Workers' compensation in South Dakota is paid for by South Dakota employers at no-cost to the employee. It eliminates the right of the South Dakota worker, in most cases, to file a personal injury claim against the employer for compensation for a South Dakota workplace injury or occupational illness. South Dakota workman's compensation is considered a trade-off for employees and their employers. South Dakota employers provide immediate medical benefits and wage loss compensation to injured employees, without claiming fault for the South Dakota workplace injury, and employees receive immediate benefits, while avoiding a lengthy court battle. South Dakota employees can hire a South Dakota workers' compensation lawyer at any point in the workers' compensation process, or they can file their own worker's compensation claim. Some injured workers will be able to handle their work comp claims on their own, especially if their South Dakota work injury is minor and their employer is determined to ensure they get the benefits they deserve. Unfortunately, however, South Dakota workers' compensation claims do occasionally get denied and employers will always have their own worker comp attorneys working for them. If you have been injured at work and your employer has denied work comp benefits or your South Dakota workplace injury is severe or permanent, contact a South Dakota employment attorney who can help with any part of the South Dakota workman's compensation process. 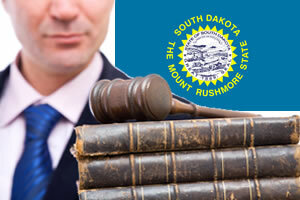 Need legal help getting benefits for your South Dakota workers compensation case? Simply complete our free form below to get started today! Work injuries which occur while an employee is engaged in their normal job functions are generally covered under South Dakota workers' compensation law. If an employee has intentionally tried to injure themselves or another employee, has flagrantly disregarded established safety procedures, was injured due to intoxication or while travelling to or from work, they may be denied workman's compensation benefits in South Dakota. Medical Benefits - Paid medical expenses are provided to injured South Dakota employees for all necessary and reasonable medical expenses related to their work injury or occupational illness. Medical benefits can include: hospitalizations, doctor's visits, medical supplies, prescribed medications and laboratory services. South Dakota employees are allowed to make the initial choice for their treating physician. Talk to your employer prior to seeking medical treatment for a workplace injury. Temporary Total Disability Benefits (TTD) - Temporary total disability benefits (TTD) are paid to injured South Dakota workers who are unable to work due to a work injury for at least 7 consecutive days. If the worker misses 21 days or more of work they may be entitled to receive compensation for the first 7 days of missed employment. TTD benefits are paid at 66 2/3 of the worker's average weekly wages up to South Dakota's maximum allowable amount. TTD benefits are paid until the worker is able to return to work or light work. If a worker is able to return to light duty work and the employer is not able to accommodate their restrictions the employer is supposed to make an effort to find new employment if possible. Permanent Partial Disability Benefits (PPD) - Permanent partial disability benefits (PPD) may be paid to South Dakota workers who suffer a work injury and have a permanent partial disability. Compensation for PPD benefits is based on the type of injury which can be scheduled or non-scheduled. Impairment ratings for injured employees are based solely on objective guidelines established by the American Medical Association. The impairment rating is supposed to be an objective method used to establish the percentage of damage the worker has suffered. PTD benefits are calculated by considering the worker's pre-injury wage, the impairment rating and the number of weeks assigned to the work injury. Under some conditions, PPD benefits may be paid in a lump sum payment. Permanent Total Disability (PTD) - Permanent total disability benefits (PTD) may be paid to South Dakota workers who have been so severely injured at work that they are unable to return to any type of substantial employment. PTD benefits are paid at 66 2/3% of their weekly wages subject to a minimum ($299) and maximum ($597) which is determined by South Dakota state law. PTD benefits can be paid for the duration of the work injury but are offset by Social Security Disability benefits. Death Benefits - Death benefits are paid to the surviving dependents or spouse of the deceased South Dakota worker. Death benefits can include lost wage compensation which is 66 2/3% of the worker's average weekly wages for life. Spouses who choose to remarry may receive a lump sum payment for wage loss compensation which is equal to 2 years. Death benefits may also include burial expenses which are paid up to the state's maximum allowable amount which is currently $5,000. Vocational Rehabilitation Benefits - Vocational rehabilitation benefits vary by state but are generally provided to injured employees who are unable to return to work due to their work injury. Vocational rehabilitation services can include a variety of services which are intended to help the worker either return to their previous job or if the employer is unable to perform their previous employment, than work which is suited to their current physical or mental conditions. Talk to your employer or a South Dakota workers' compensation lawyer if you believe you are entitled to vocational rehabilitation services.